India Joy Giver Experience - Resounding Joy Inc.Resounding Joy Inc.
Wednesday was an amazing day! We began the day at a special needs school in Razole. 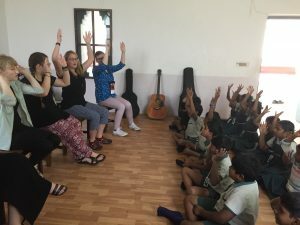 Annela led the first half of the session and the team sang along in Telugu on the songs that we day learned the day before. As the session continued, the building exploded with children from the neighborhood school and government officials. So many children attended that was hard to tell who was our client and who was not. After leading several experiences Annela split the children into three groups and set us loose. Taylor and I began our session plan and we flew through it so fast that we had to repeat everything twice. This ended up being a good thing, as it allowed several of the clients to really get into the experiences and be successful. 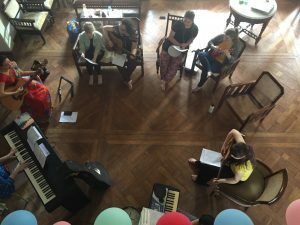 Seeing the universal language of music work through the language barrier in these sessions (as many of the clients didn’t speak English) was amazing. Another thing I learned through this session was that confidentiality is approached very differently in India and it isn’t really a thing here. Diplomats and parents snapped photos and videos the entire time and they even put our team in the regional newspaper. 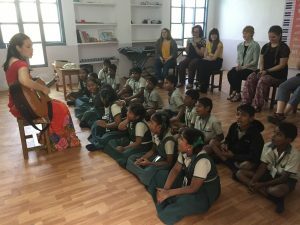 Seeing their passion and how they wanted to show other districts and states around India what music therapy is and how if can be effective with special needs schools was cool. We had so many great moments yesterday with the children and they were so sweet. Following this amazing experience, the man who was in charge of all the special needs schools in the district wanted to honor us. 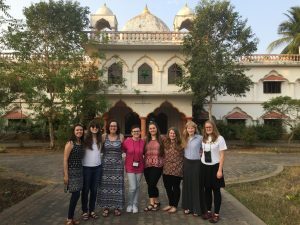 He and some of the staff performed a ceremony for each of us placing a red bindi on our foreheads, handing us a rose, and draping a beautiful sash of fabric across our shoulders. It was so humbling to be looked at as honored guests when we were honored to simply be here. After the ceremony they took copious amounts of photos of us (another cultural norm) and they fed us a delicious meal. Following a short break and debrief back at our home stay called “the palace” (it’s quite huge) we left for the elder house. I’m not sure if I can accurately describe how beautiful this session was. The room was filled with clients and they all played instruments as the team sang in Telegu. 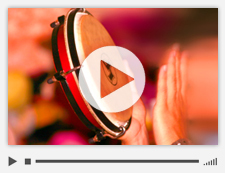 Several of the clients sang along as well and one woman when given the buffalo drum to lead a song called “Stotram Stotram, Yessaiya” stood up, closed her eyes and belted at the top of her lungs while her arm holding the mallet danced up at down. This pure form of unfiltered expression was beautiful. She sang like this several times throughout the session, but none of the them were quite like the first time when she stood up to sing. I lead an adaptation of an entrainment game with the help of the entire team. I feel so blessed to be able to work with this incredibly talented group of ladies. While there were so many great moments in the session, my favorite was an interaction I had with an elder gentlemen who while we were singing “Davidu Vale” and he locked eyes with me. Each time we got to the refrain, he sang along smiling ear to ear. It was so amazing how connected we were even though we didn’t speak the same language. All in all it was such an incredible day and I am really looking forward to what the next few days hold.